The School of Engineering of the University of Porto (FEUP) is located near the Circunvalação National Road (EN12) and next to Hospital de São João. FEUP is served by line D (yellow). The closest station to FEUP is IPO station. When you arrive at I.P.O. station: go on down to the end of Rua Dr. Plácido da Costa; cross Rua Dr. Roberto Frias; FEUP is on your front (check the image below). Porto metro has three stations downtown, all served by the yellow line: São Bento, Aliados and Trindade. You don’t need to change lines to get to FEUP. For more information please visit Metro do Porto and System Map. There are 4 bus lines in FEUP’s area: 204, 300, 301 and 803. 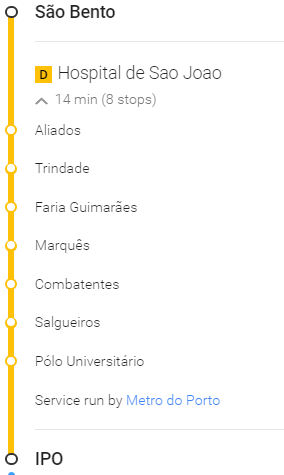 To and from the Hospital de São João there are other lines available. For more information please visit STCP or Itinerarium websites. 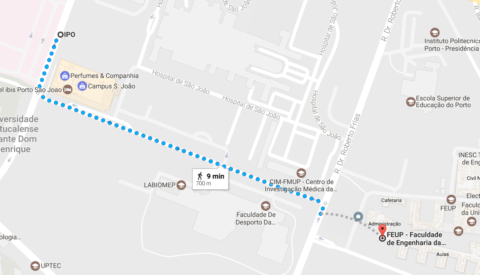 The best way to find the Faculty of Engineering is to follow signs to Hospital de São João. 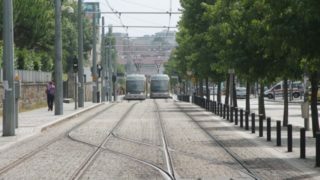 FEUP has three car parks adjoining its south perimeter, all of which are accessible from Via Estruturante (which runs at right angles to Rua Dr. Roberto Frias). Coming from Ermesinde, Gondomar and Valongo via the Circunvalação ring road (EN12): Follow the EN12 until you find Hospital de São João on your left. Go straight on at the traffic lights with Rua Dr. Roberto Frias and keep left. At the next traffic lights, turn left into Rua António Bernardino Almeida (the IPO will be on your right) and go straight on across Rua Dr. Plácido da Costa. Keep left until the next junction, and turn left. Go down this road until you reach another junction and turn left. Go to the end of the road and turn left into Rua Dr. Roberto Frias. Keep right until the junction with Via Estruturante and turn right. Coming from Maia and Matosinhos via the Circunvalação ring road (EN12): Follow the EN12 until you find the IPO on your right. Enter the right lane at the traffic lights and turn right into Rua António Bernardino Almeida (in the periphery of IPO). Go straight on through the junction with Rua Dr. Plácido da Costa. Keep left until the next junction and turn left. Go down this street until you reach another junction and turn left. Go to the end of the road and turn left into Rua Dr. Roberto Frias. Keep right until the junction with Via Estruturante and turn right.